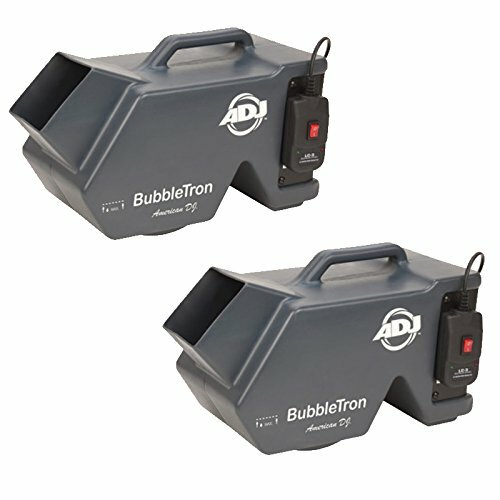 The Bubbletron by ADJ is a smaller lightweight bubble machine that features a bubble production rate comparable to larger machines. It's EZ-Access front fluid tank makes the Bubbletron easy to use and easy to clean. Make bubbles apart of any show anywhere with the extremely portable Bubbletron Bubble Machine from American DJ. You'll have a exciting bubble display in no time, whether at home, at the club, bar, or on stage. You'll be amazed at the bubble output rate of the Bubbletron as well as their high quality and velocity. Especially when coupled with lasers, bubbles and be a super exciting addition to any style of show. With the easy to use features, durability, and portability of the Bubbletron Bubble Machine from ADJ, you won't have anything to worry about. Just turn it on, let it run, and have some fun.